Larabeth McLeod has beauty, money, several patents, a Ph.D., a successful environmental firm, and some very old secrets. When a man with the uncomfortable name of Babykiller begins stalking her, terrorizing her with stories of her darkest days in Vietnam, stories no one else knows, she feels compelled to fight back...until he exposes her most tender secret of all by threatening the daughter she has never met. She turns to private detective J.D. Hatten for help, breaking five years of separation and silence between quarreling friends. And then Babykiller shows his true capabilities. He is the head of an illicit business offering but one service--moving cargo worldwide for criminals who need their drugs or cash or smuggled goods shipped safely and anonymously--so he is capable of putting anything anywhere. He quietly explains to Larabeth, a well-known environmental executive, that he can even put defective gauges in nuclear power plants, and he will, just to get her attention. If she goes to the police for protection, people will die. Lots and lots of people will die. And one of them will be her daughter. WOUNDED EARTH is the first thriller by award-winning mystery writer Mary Anna Evans, author of ARTIFACTS, RELICS, EFFIGIES, FINDINGS, and FLOODGATES, all available on Amazon in print, large-print, and audio editions. WOUNDED EARTH, featuring environmental scientist Larabeth McLeod, was inspired by my experiences traveling across the country, inspecting manufacturing plants and hazardous waste sites, hither and yon. I am here to tell you that there are some scary things out there. I am also here to tell you that I'm very glad there are people like Larabeth out there to protect us from those things. Mary Anna Evans' books have received praise from awardwinning authors like Tony Hillermans, who called her work "fascinating" and PUBLISHERS WEEKLY, which has called it "absorbing" and "compelling." She has received awards including the Benjamin Franklin Award and the Florida Book Awards Bronze Medal. 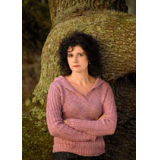 Her work has been listed on VOYA's annual list of "Adult Mysteries with Young Adult Appeal" and both BookSense's and IndieNext's lists of Notable Books.